"The butterfly flutters above and over the earth, borne on the air and shimmering with light...We ought really to see them as nothing other than beings of light, joyous in their colours and the play of colours. All the rest is garment and luggage." 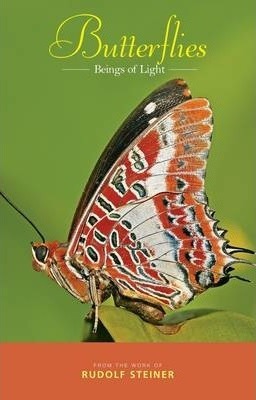 - Rudolf Steiner Truly poetic and deeply esoteric, these lectures by Rudolf Steiner have been gathered here in a single volume for the first time, with an in-depth introduction that traces and explains the stages of butterfly metamorphosis. The emergence of the butterfly from its pupa is one of the most moving phenomena we can encounter in nature. In this creature's visible transformations, we can experience a revelation of spirit. The butterfly, says Rudolf Steiner, is "...a flower blossom lifted into the air by light and cosmic forces". It is a being that develops from and through light, via a process of incorporation and internalization. By gazing into the world of these special and rarefied creatures, we can intuit that they, "...ray out something even better than sunlight: they shine spirit light out into the cosmos".